The NCF nurse chapter in Omaha submitted a proclamation request to the governor of Nebraska to proclaim Healthy Clergy Week for October 12-17, 2014. They are encouraging all nurses and health care professionals in their state to do something special for their clergy that improves their overall health and well-being. As clergy take small steps toward better health, they become positive role models for their congregations. 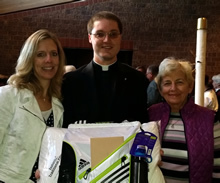 At Saint Columbkille Catholic Church in Papillion NE, priests were given a gym bag, ear buds, iTunes card, and information/educational material on how to stay healthy. They also received a memory foam pillow because good sleep is essential to health. One priest even received a Fitbit activity tracker! All these items were donated by the parish nurse team. The NCF Nebraska chapter reached out to the Faith Community Nursing Network in their community and now they have partnered together to reach out to over 400 churches in the Omaha/Metro area to see what needs they have for improving health in their clergy and congregations. Once the NCF chapter identifies the needs of the clergy and their congregations, they plan to apply for grants to fund the costs associated with their project. The idea came from an article published in the Journal of Christian Nursing (article free for a limited time). The group hosted a continuing education journal club review to discuss the article, "Health Report for U.S. Seminary Schools: Are We Training Healthy Clergy?" The NCF of Nebraska chapter hosts monthly meetings and quarterly accredited continuing educational programs which are highly valued by their members and the community. You can partner with NCF of Nebraska by praying for the health of your clergy this week and considering how to make Healthy Clergy Week a year-round event in your area.